Included Bakhchisarai Excursion. 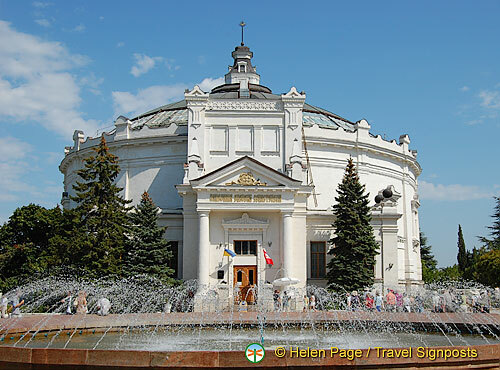 Join this morning’s coach excursion to Bakhchisarai, the former capital of the Crimean Peninsula during Ottoman rule. Here, you visit the ornate Khan Palace, a complex including the lovely Fountain of Tears, harems, mosques and other buildings. It is a striking example of Tartar-Muslim architecture.Sevastopol Leisure Time & Optional Tour. Return to your ship for lunch and enjoy the rest of the afternoon exploring Sevastopol on your own. You may want to join an optional excursion to Balaklava, set in a picturesque valley a few miles away. This beautiful region has been described in myths and sagas, including the legendary Ulysses. The town is also famous as the sight of the infamous “Charge of the Light Brigade” during the Crimean War. On this tour, you will also visit the famous Panorama Museum with its “Defense of Sevastopol” panorama. Here you can see the most impressive presentation of the heroic defense of the city during the Crimean War 1854-1855. It is one of the best examples of panorama art (cost of the optional tour is the equivalent of €27, which includes coach transportation and a guide). Return to your ship for dinner. Your ship departs for Yalta late in the evening. Visit to Bakhchisarai was yesterday. Today is a full day of excursions covering Sevastopol’s Crimean War history. 09:00 We leave for a City Tour of Sevastopol by coach. Visit to Malakhoff Hill, scene of the Siege of Sevastopol. After this included city tour, passengers not joining in the optional excursion to Chersonese are dropped back to the ship. 14:30 Leave for optional shore excursion to Balaklava and the Sevastopol Panorama Museum. Both of these are very interesting to people who are interested in Sevastopol’s Crimean War history. The Panorama Museum is excellent and at Balaklava you can visualize for yourself scenes from “The Charge of the Light Brigade”. This afternoon we also make a stop at an old top-secret Russian underground nuclear submarine base known as Object 825 GTS. It’s an amazing place, like something out of a James Bond movie. Back to the boat and at 18:00 there are Light Snacks for those attending the optional Black Sea Band & Dance Ensemble. The performance by this famous troop is very lively and entertaining. For passengers not attending the concert, dinner is at the usual 19:30. 21:00 Those with a fondness for Vodka can join in a Vodka Tasting with the Hotel Manager. 21:00 Dinner for those returning from Black Sea concert. River boat sets sail for Yalta.